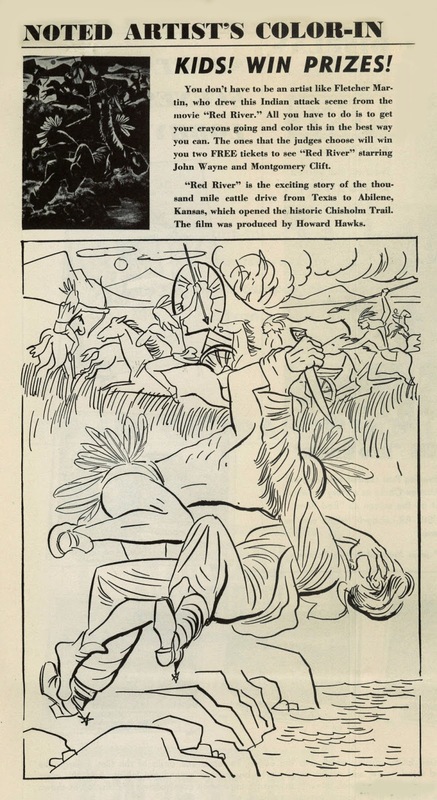 Shot two years ahead of release, held up for editing (troubled), lawsuits (Howard Hughes satisfying a spite), and other delays that might have portended a stiff, but Red River went on to triumph, sold boldly as third of but three to have achieved greatness --- The Covered Wagon and Cimarron being forebears. So there at least is insight as to which sagebrushers were figured a finest to '48. Nowadays you can't get Wagon or Cimarron arrested. Don't know about the rest of territories, but NC had Red River flowing through hardtop/drive-ins well into the 70's. Our Starlite encored it often, as late as '74, and whenever corn-dog lots needed a third for John Wayne all-nighters, it would invariably be Red River welcoming the dawn behind likes of Donovan's Reef or The War Wagon. 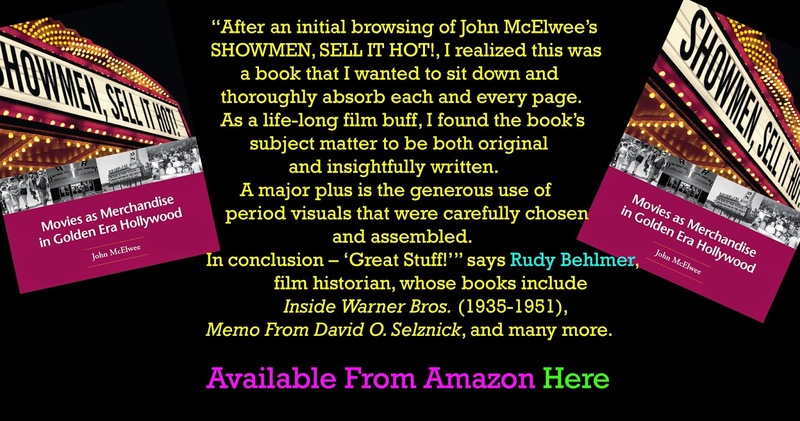 Now comes RR riding out of Criterion, plus a Region Two release, on long-awaited Blu-Ray with clarity enough to taste trail dust, being the "book version" as opposed to narration from Walter Brennan, the latter being what syndication tendered for lo many years before home video and now BR supplanted same (Criterion's release offers both). Red River for me has always been combination of perfection plus parts to bring on squirm. 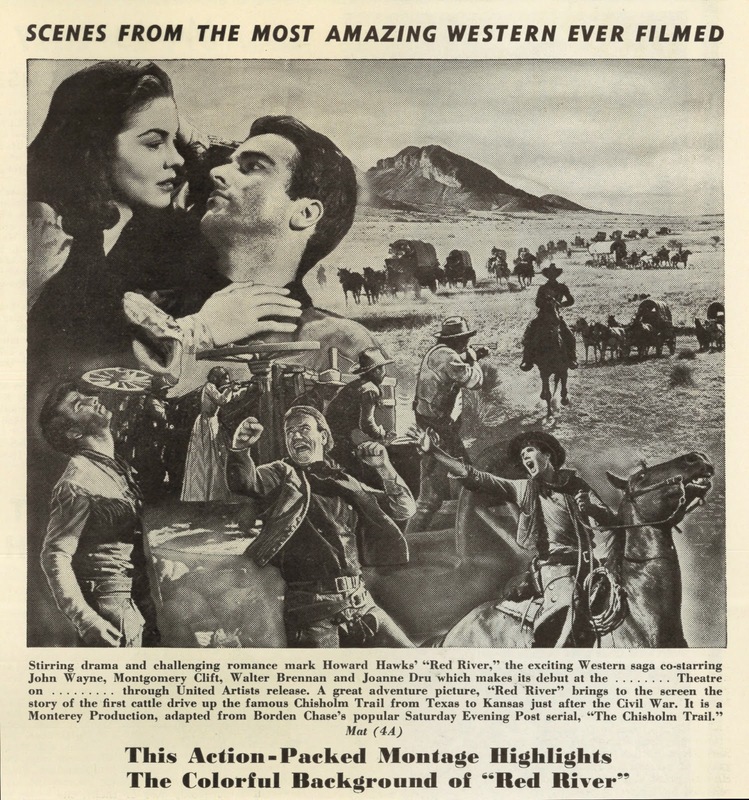 There is epic-ness from its opening; we figure here is a big one that will just get bigger with passage of reels, what with dialogue promise of a massive cattle drive interrupted by "border gangs," outsize Indian attacks, and inevitability of a Montgomery Clift/John Ireland showdown. 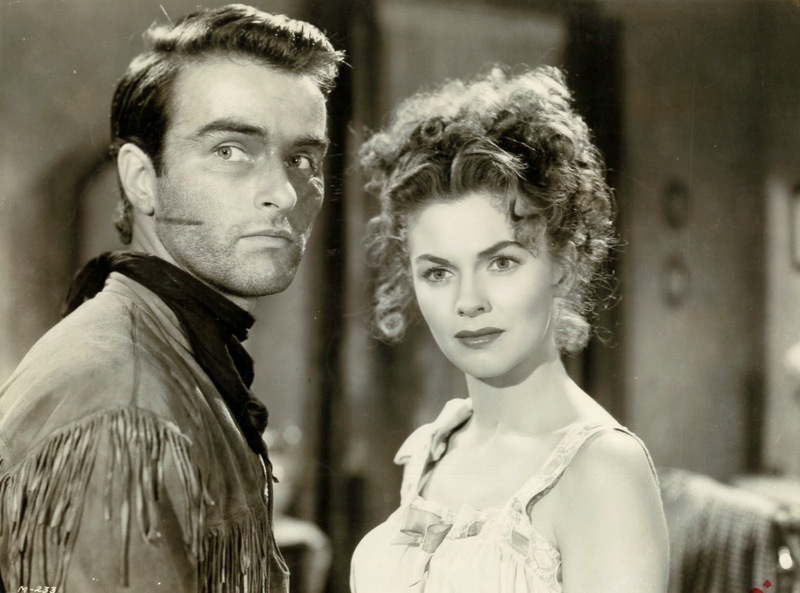 That little of these happen and still Red River is good speaks well to Howard Hawks' delivering on money that lagged behind a script's ambition. A lot of Red River is talk, there being nothing wrong in that where Hawks is ventriloquist, but sometimes chat goes past our undivided attention. When man of few words Wayne walks out of scenes, it's left to Clift, Brennan, others to lay down exposition by yards. That happens later too, when characters have to explain what makes Clift's Matt Garth tick, these among deeper holes we cross over Red River. And why must Joanne Dru go on --- and on? Even Wayne can't shut her up. For pure silly, there's nothing like Dru and company under redskin siege and her asking Clift why he's "so mad." Then she's shot clear through by a poison arrow to barest flinch reaction. Last time I checked, those things hurt, and yes, I'll forgive Hollywood being its unreal self, but this part must surely have got laffs even in forgiving '48 when they were more used to such absurdity. What really saves the enterprise is John Wayne. Hawks minus an actor this strong would come a cropper before and after Red River. Look at The Big Sky (or better, spare yourself), which is longer and as would-be epic as RR. The difference is happy-go-lucky in a most irritating sense Kirk Douglas, who shows vivid why he'd never be in Wayne's class where action heroing was the task. Did Hawks try, and fail, to get Wayne for The Big Sky? 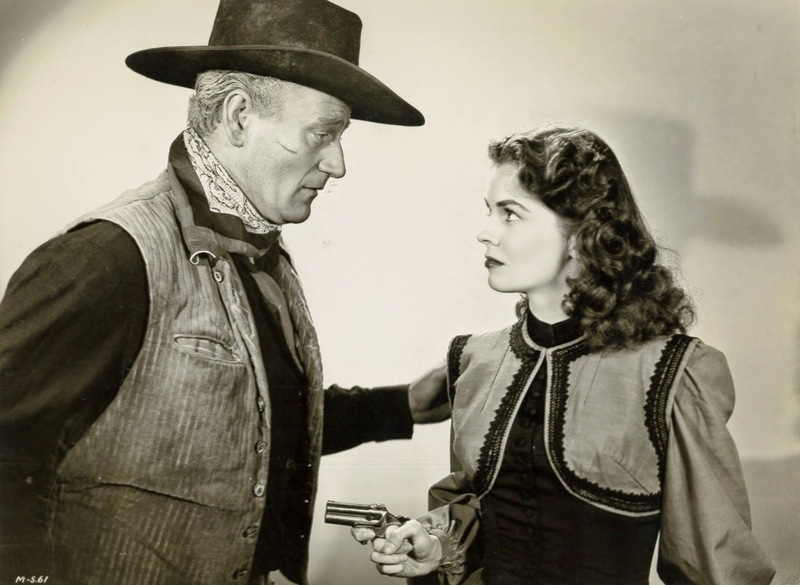 By 1946, when Red River was shot, JW was poised for Top Ten placement, that being his pretty much from this show to a career's end. There is so much detail and yes, subtlety, that you'll see in his perf, now that it can be crystal-viewed. Who knew Blu-Ray would render great actors even greater? Gold age, especially B/W, work has suffered a lot for sub-standard presentation through the years. 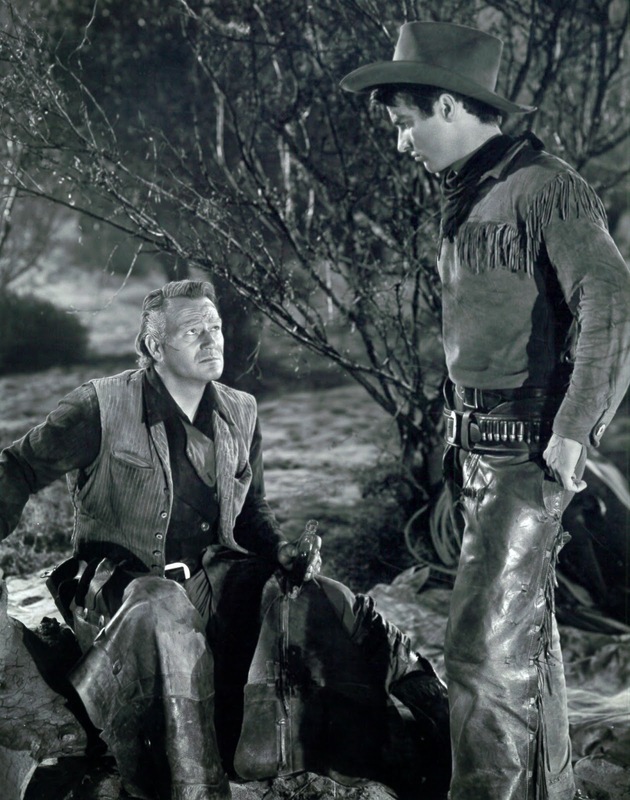 Here's random ways Wayne excels, and just in a first Red River reel: The trail boss warns him not to leave the wagon train because he'll be "riding into trouble." Wayne gives him that look that says, You're warning me about trouble? We recognize a man who has lived with, if not gone looking for, perils in the wilderness. There were few in the action trade who could pull that expression, knowing and a little humorous, and make it stand for what would follow in a next two hours. By this stage of his career, and at age thirty-nine, Wayne had grown real authority. Look, for instance, at his eyes as Indians encircle his camp during night. The scene is played still and fairly close-up, but Wayne's head doesn't move back and forth to the sounds, just his eyes, and these become more urgent as we, and he, realize attack is imminent. Another favorite ad-libbed (?) Red River moment: Can't you keep that horse still? That Wayne underplayed for most of a career, at least until broadening slapstick infected his 60's stuff, is well-known and endorsed by ongoing acceptance of his style and continued popularity of JW's better films. Wayne had constructed his image as deliberately as any star borne of self-manufacture. A lot want to think he was like the image, but that was years becoming the case. JW didn't believe in "John Wayne" until weight of the icon confused even him as to what was real or faked. As of Red River, he was pure calculation and still a work in progress. Wayne took a lot of instruction from elders and used them as example. He had been raised to respect experience and so wasn't too proud to receive instruction and make helpful use of what vets could teach. Such humility paid off handsome. Wayne was early instance of a star that studied stars who'd gone before. 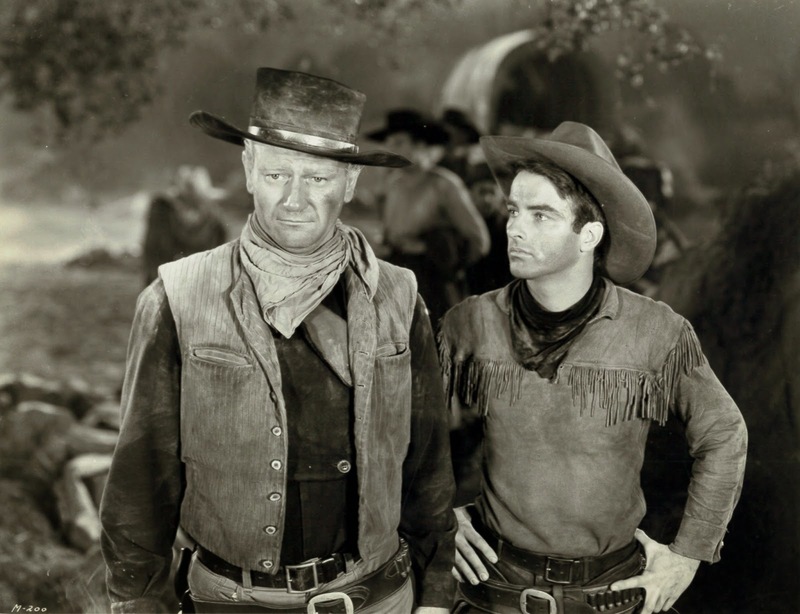 It's known he emulated Harry Carey, but there was also Douglas Fairbanks and Buck Jones, both of whose memorabilia Wayne collected to the end of his life. A friend told me of being approached by JW for one-sheets and lobby cards on Fairbanks, one enthusiast looking to score rarities from another. A Horror Ahead Of Its Time? I'll go on a limb to ask this: Did Night Must Fall have impact on audiences similar to Psycho twenty-three years later? And here's another: Did Hitchcock get his idea for off-casting benign leading men as bent killers from seeing Night Must Fall? I realize this Metro adapt from a Brit stage hit pulled punches, but coming from the thriller-timid lion, it was a brave roar. We never do find out for sure what's in Robert Montgomery's hatbox, though mere thought of its being a dismembered head would have been enough to traumatize audiences who'd never been exposed to stuff rough as this. Was Night Must Fall the first major talking picture about a serial killer who dismembers victims? I pondered that while watching --- couldn't offhand think of any. I'll bet Night Must Fall handed out more nightmares than whatever Frankensteins and Draculas the 30's gave us. MGM actually tried to distance itself from the finished product for fear of backlash, so say histories. Bob fought valiant to play the thing after seeing NMF on B'way and realizing this was the image tweak for him. Elizabeth Montgomery remembered her father hiding in the closet to whistle his character's baleful theme (Mighty Lak A Rose) and scare hell out of her (scarcely a wonder Liz had Daddy issues). Montgomery does a beautiful show of sinister here, maybe his best performance in anything. Till 1937 a cocktail and shakers man, RM put forth a creep well off path he'd trod so far at MGM. Had any talker star, especially of romantic bent, done such before? 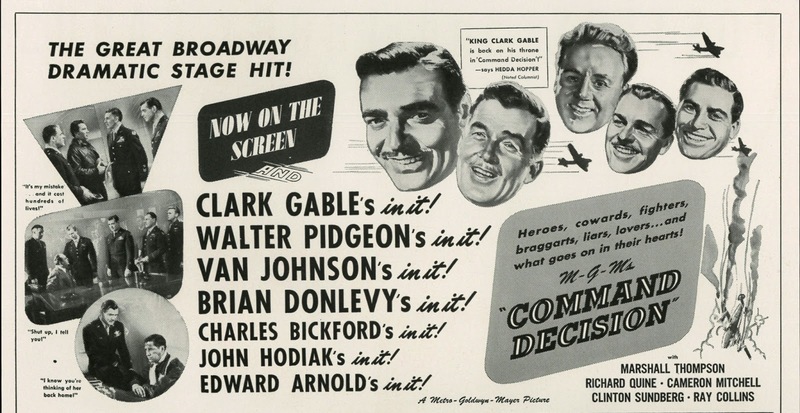 Hitchcock had to have been mightily impressed by Night Must Fall (likely an only occasion when a film under Richard Thorpe direction would inspire him). 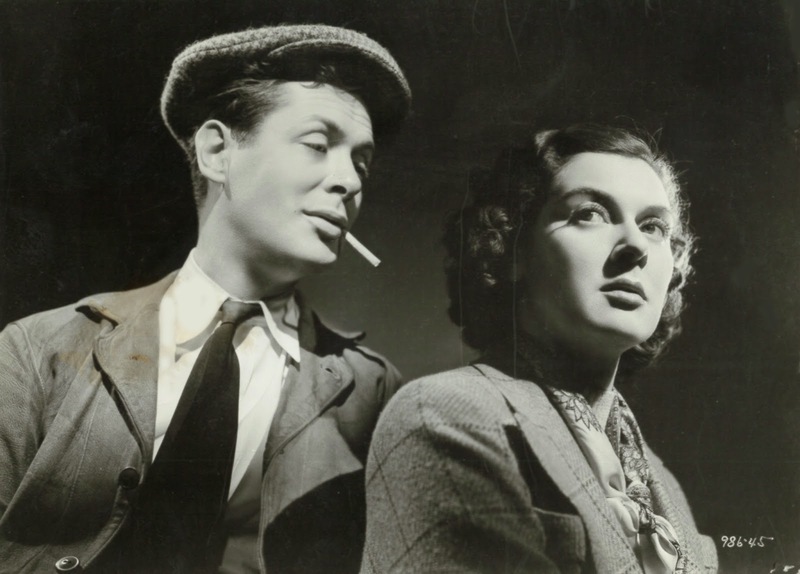 AH's stuff admittedly topped Night Must Fall, but the latter came first, at least insofar as stars misbehaving so. There's more than a little Montgomery in Robert Walker's Bruno Anthony of Strangers On A Train, and of course, Anthony Perkins was final summation of nice young men doing the unspeakable. 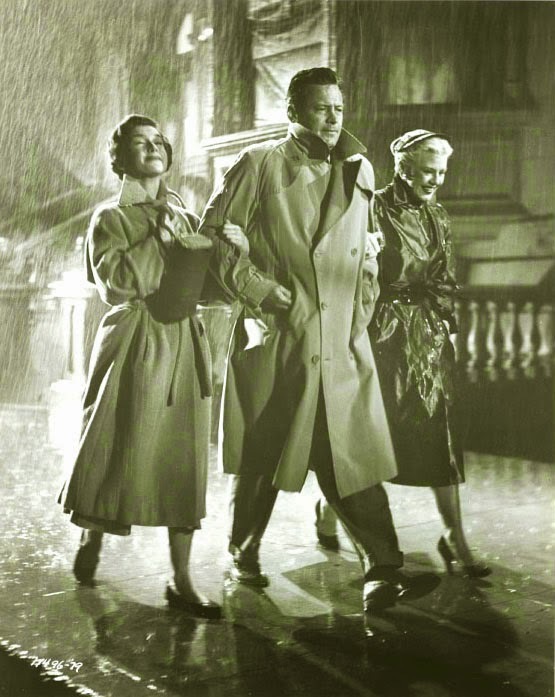 I admired Night Must Fall as much for what it might have been as what it actually was. For all of caution and Code restraints, this was still pink, if not blood red, meat for 1937. Queasy notion that charmer Bob has chopped up and planted a body in the garden outside a quaint English cottage is still potent stuff of sleeplessness, and we don't really need to see that head to know it's stored in his grip (one character picking up the box comments that "this seems awfully heavy for a hat"). Night Must Fall was remade in the 60's, with Albert Finney far more explicit in his cleaving, but that one lost money for Metro, whereas the 1937 earned profit, if modest, for such disturber this surely was. I always figured exhibitors were creative participants in movies because it was them that applied punctuation to what Hollywood produced. No film was really finished till showmen got hold of it. They'd look at a pressbook, trailer, synopsis, or trade ad, and right away know what aspect might sell. A single ad done right could boil a convoluted story to its essence. Scholars have spent book lengths trying to define precode, the job having been done for them long ago by original merchants of the form. What west coast producers shipped each week was less finished product than rawest clay to be molded by east coast personnel, with finishing touch applied by theatre management where all bucks stopped. He/she would size up ad accessories and decide if same could be applied to needs of his/her community. Local desks where promotion got prepared was where rubber met the road insofar as keeping lights lit and staff paid. Illicit was mother's milk to aggressive selling. Consider first the title --- one word and quick to the point, a natural for marquees needing what space there was to boost support attractions (Illicit plus Mickey Mouse!). 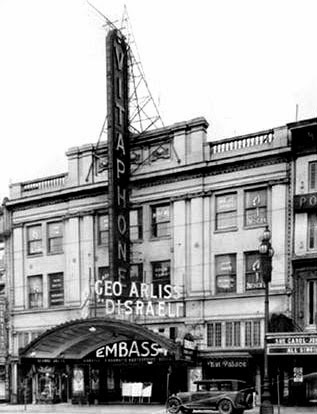 The old Embassy Theatre in San Francisco, lately renamed the Warner Bros., had been swallowed by earthquake during construction (1906), then rose from ash to be named, renamed several times during interim. 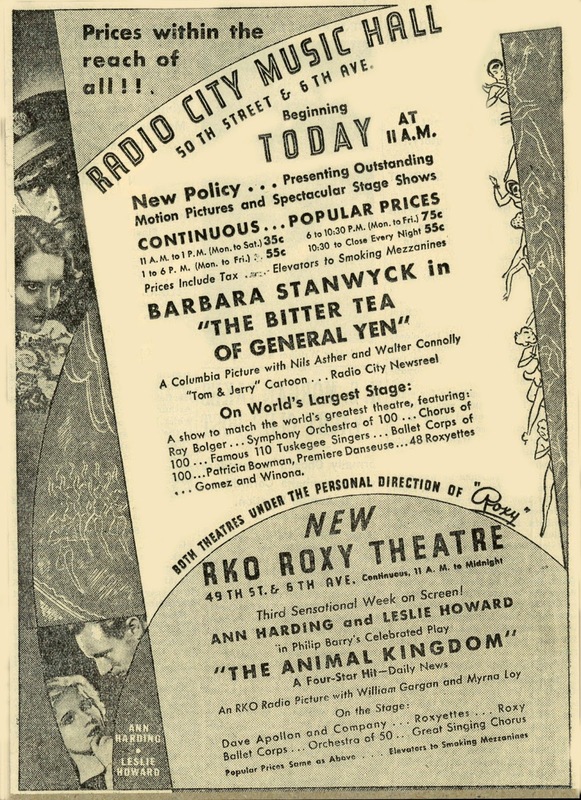 Warners used the site to showcase Vitaphone (as above with Disreali in 1929), then bought the 1,387 seats outright. 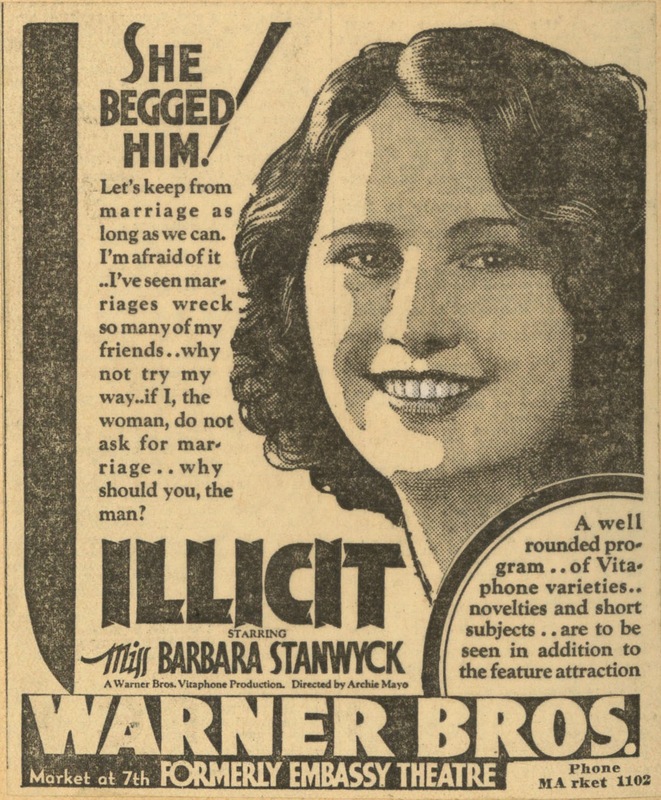 Illicit would "World Premiere" on 1/9/31 at a dollar per ticket, Jack Warner, Barbara Stanwyck, and Mervyn LeRoy personally appearing. Babs was billed as "San Francisco's Own Daughter," but cursory research says she was Brooklyn-born. Suppose anyone challenged the boast? Illicit isn't really much of a movie, precode or otherwise, being stiff in joints thanks to talk and pace still on wobbly feet. There hadn't been a lot of lively WB work out of 1930 gates (a few like The Dawn Patrol being notable exception), but the following year showed big strides. What's good about Illicit is forthrightness of modern girl philosophy as expressed by Barbara Stanwyck. She spends whole of a first reel explaining to dullard live-in James Rennie why they should not be married, speech given from horizontal clinch on a divan. He's tired of "pussyfooting" and shun of standards, ... but I Love Pussyfooting! says she, an excerpt that would decorate a number of docus about precode. 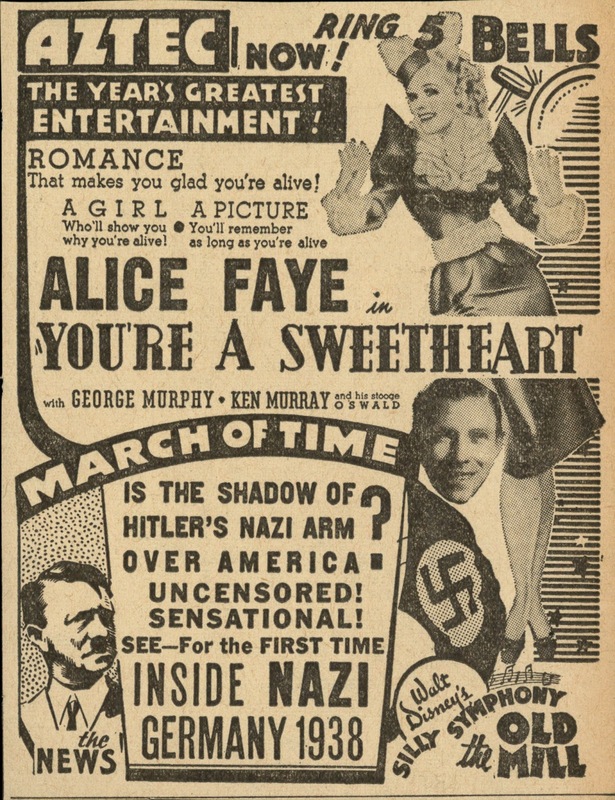 These ads from first and holdover weeks at the Warner Bros. cull all of what's hot-cha from Illicit ("If I, the woman, do not ask for marriage ... why should you, the man?"). To it's credit, Illicit does deliver on promise of taglines, if doing so at relax pace. 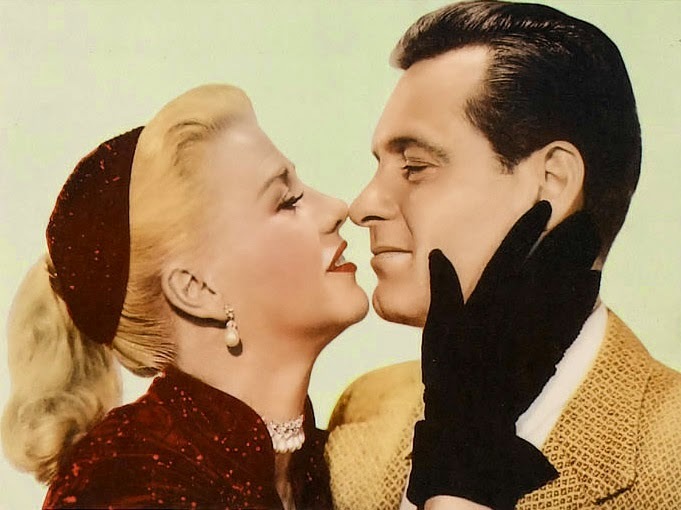 Warner Archive offers a DVD, and Illicit streams in HD at Warner Instant. I'll be covering more of these ancients, that more a threat than promise for some, but what compels like civil war subjects done by folk among whom remembered Blue-Gray conflict first hand? 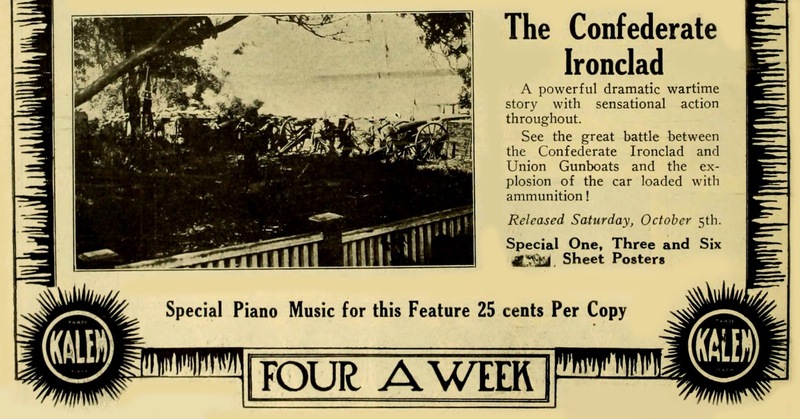 The Confederate Ironclad was made in Jacksonville, Florida by the soon-enough-to-fold Kalem Company, another of single reel grocers that sold film by pounds rather than merit. Often they'd ring the bell, as here, with pace and excitement to approach Griffith at Biograph, plus inherent appeal to yarns revolved around ironclad v. gunboat action. There's girl spying afoot, this belle's crinoline a disguise for Yankee probing into whereabouts of Reb fortification. Program notes in a booklet for Treasures From American Film Archives (Volume One) speculate that the ironclad used was built to commemorate the anniversary of actual battle twixt Monitor and Merrimack, those names tripping off tongues of Civil War buffs for 150 years since the two clashed for real. Replicas supplied grandeur rare to nickelodeons of the day, and what whoops battle scenes here must have provoked! The survivor print looks great, and there's music from original score sheets to further authenticity. Silent drama shorts like this can be fun and even memorable, and the DVD Treasure sets are just that for gathering so many and presenting them so well. 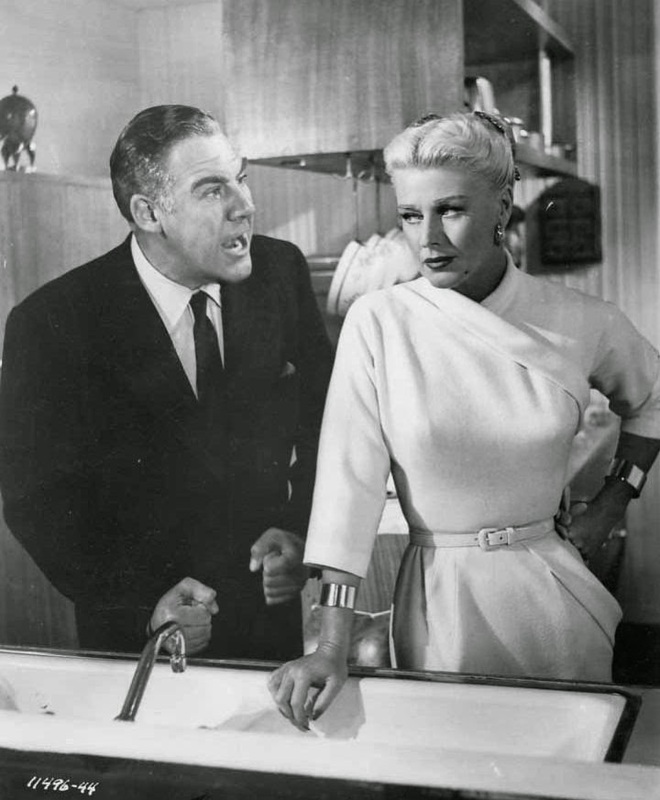 Columbia got its licks from Washington for what Mr. Smith had done there, so was this time careful to put as much civics lesson as comedy into Born Yesterday, a defanged depict of politicians bought by loudmouth Broderick Crawford as he shacks up in DC with apparent birdbrain Judy Holliday. This was the latter's breakaway to stardom after capture of raves for the part on Broadway and being eccentric support in a handful of films (most recent and notable of these Adam's Rib). Judy and Brod share a hotel suite in Born Yesterday, big as a floor, but apparently not a bed, though it's left for us to imagine they do. Holliday was something different in realm of humor, her line readings like no one else's before or since. 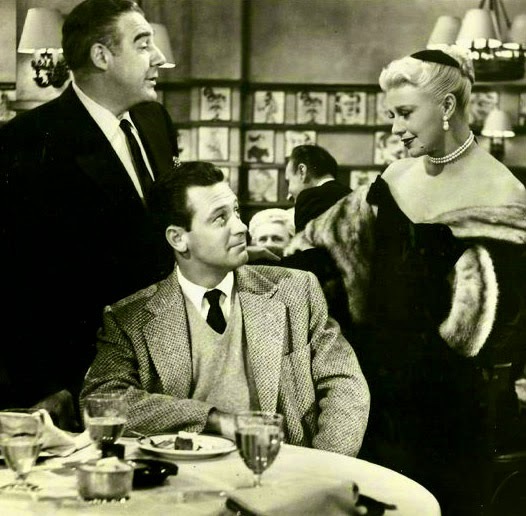 Director George Cukor hailed her ability to go from farce to pathos in a single shot; it's still apparent, and effective, in work she does here with both Crawford and William Holden. Death would close memory banks on a unique talent --- I remember TV listings from the 60's always reading "The Late Judy Holliday" whenever one of her pics was shown. Selling point by then might have been Holden as the egghead who educates JH and keeps us aware that US government is crystal clean despite Brod corrupting a congressman. "One bad apple" could never spoil such a splendid crop as ours in Washington, assures Bill. 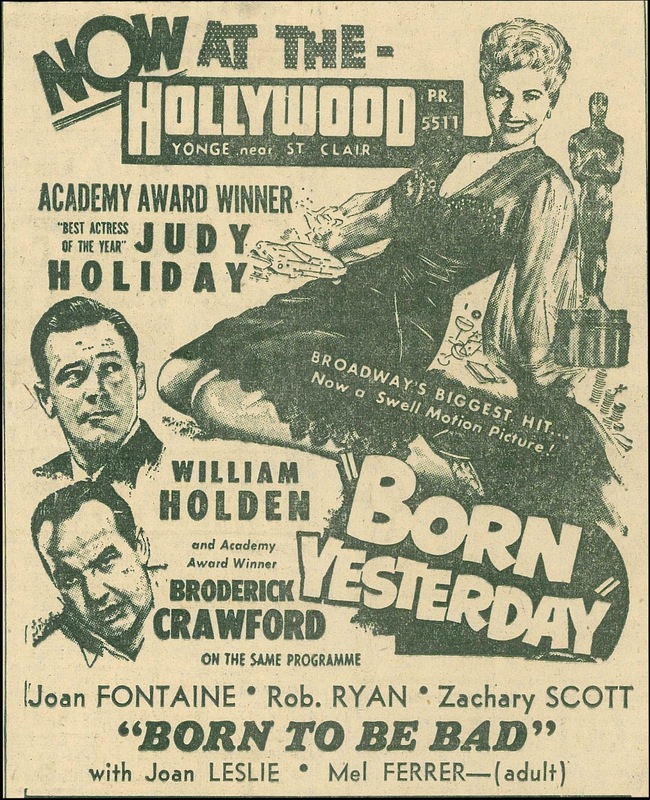 The after-drama to comedy that was Born Yesterday occurred on Oscar night (3-29-51) where Judy Holliday was nominated for Best Actress. She was a guest at Jose Ferrer's party to which fellow nominee Gloria Swanson was also invited (Ferrer and Swanson were doing a Broadway revival of 20th Century together). Jose rented New York's La Zambra restaurant and had a radio hook-up with the award ceremony should any of guests cop a win. 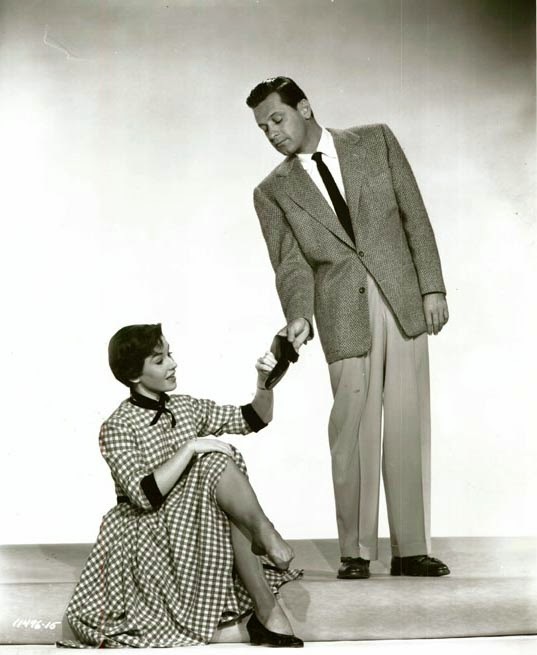 He'd been nominated for Cyrano de Bergerac, but figured Bill Holden a sure bet for Sunset Boulevard. Swanson had high hope she'd take the prize for the same film over favorite Bette Davis, whose All About Eve triumph seemed a pipe for honors. The hot wire to H'wood was for awardees to address radio listeners live from the party, Fred Astaire being airwave host. 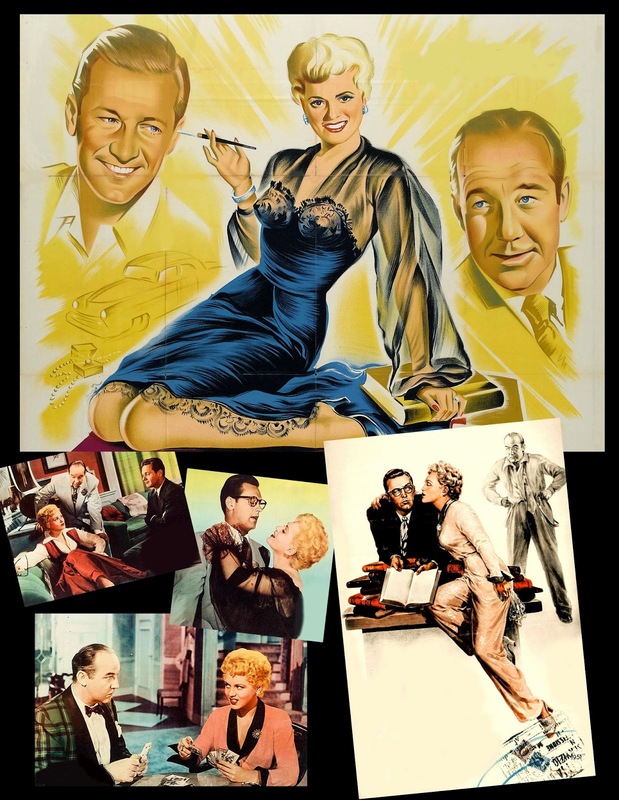 Ferrer got the Best Actor nod he'd not expected, but bigger shock by far was Judy Holliday knocking back both Bette and Gloria for coveted Actress statue. 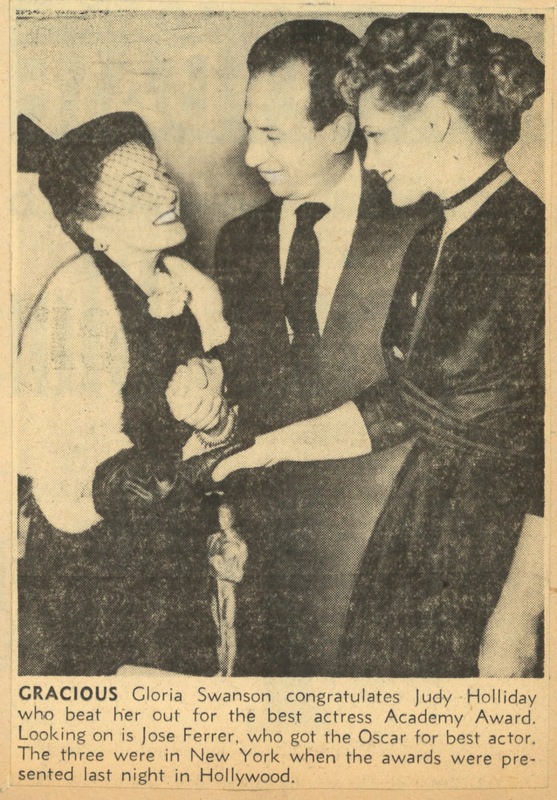 The wire photo at right tells not the real story of the winners/loser trio snapped together minutes after announcements: fact is, la Swanson was less than "Gracious" for her loss, and in fact told Judy Holliday that she was "awfully young" to have won the award, having "just started out, with a whole life and career in front of you" (GS would outlive JH by eighteen years). Gloria added that this was "my last chance" to receive such an accolade, and that now she'd miss out on rebirth as a serious actress as opposed to a personality left over from a vanished era. Still, appearances had to be maintained, thus the photo, which saw publication in hundreds of newspapers the next day. 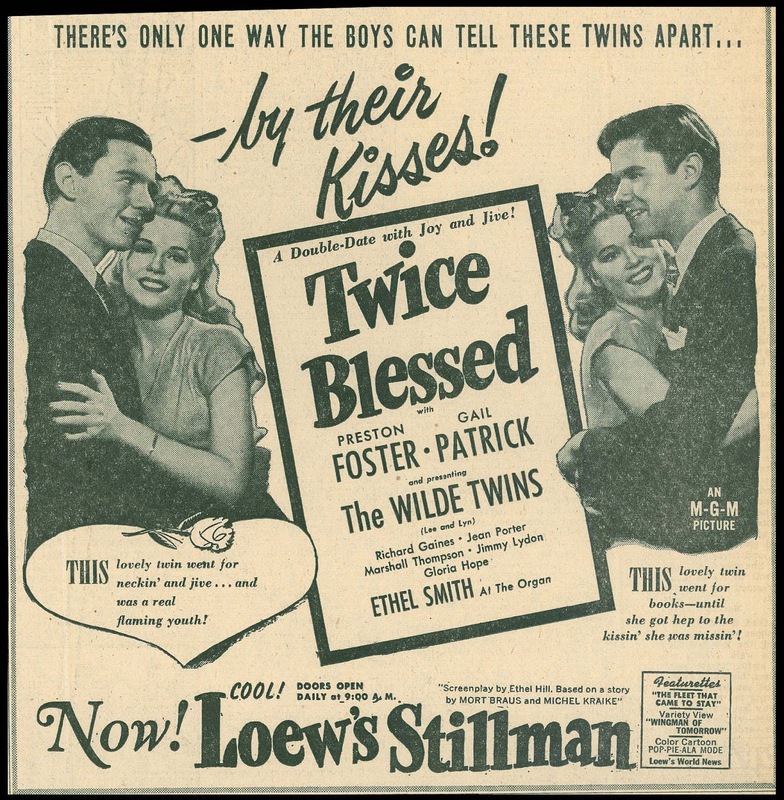 Twin teens Lee and Lyn Wilde beating The Parent Trap and its credited story origin by near-fifteen years, which makes me wonder why Metro didn't cry foul when Disney released its higher-profile remake (or was it outright steal?) in 1961. Near as I make it, the German novel (Das doppelte Lottchen) adapted by Disney was written by Erich Kastner in 1949, but surely this author caught Twice Blessed, by then out a while, though more recently to after-war Deutsch patrons. Did he copy Metro's yarn as all appearances indicate? Twice Blessed is hotter-wired to teen habits of its day than safer playing The Parent Trap, and the Wildes are surely a saucier pair than two scrubbed Hayleys. As barometer to jitterbugging 40's youth, Twice Blessed is one priceless capsule, moving brisk along 76 minutes that never goes tiring. The Wildes were a novel parlay with talent enough to score individually, even if MGM never saw fit to part them for individual vehicles. This was their sole starring showcase, otherwise work being specialty placement in Andy Hardy's Blonde Trouble and similar pix. Twice Blessed should be better known, and credited, for being first with a concept popularized considerably more by ones who'd borrow brazenly from it. Columbia drank bitter tea for the failure this Frank Capra production was --- $298,000 in domestic rentals back from a reputed million spent in negative cost. Some would say it was an art film gone wrong. 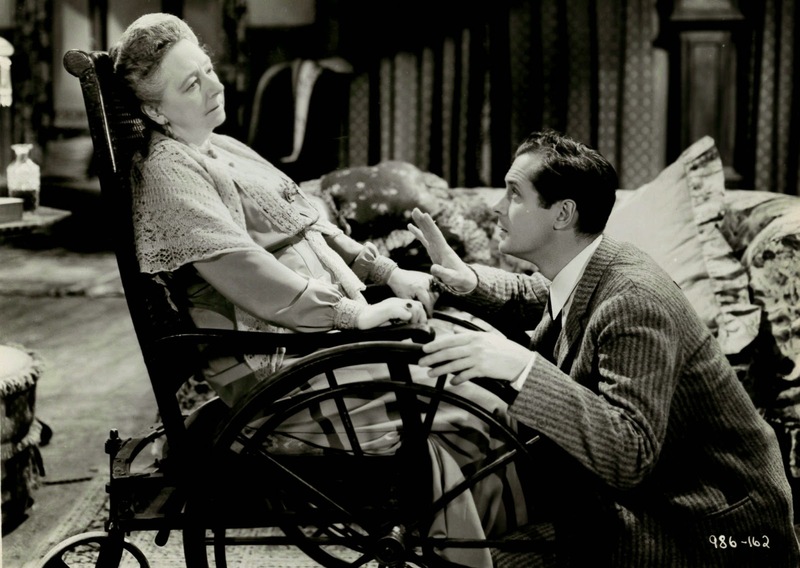 Capra admitted having supped in hopes of Bitter Tea yielding a much desired Academy Award, for which he'd not even be nominated that year. There were bad omens from premiering in early 1933 at just-opened Radio City Music Hall, a cathedral other showmen resented for its siphon-off of patronage from established Broadway houses. The Bitter Tea Of General Yen got off to a bad start there, yanked after a poor week and Radio City's inability to cover its house nut. Frank Capra had till now done comedies and actioners that patronage liked --- why poach now in exotic fields of Von Sternberg endeavor? FC thought serious might translate to gained status. He'd go through the rest of a long life placing General Yen among proudest achievements. It was, and remains, a visual stunner. One modern observer said Bitter Tea's lush settings reminded him of theatre lobbies hosting the film (Radio City's, maybe?). Never before had Capra taken such pain with the look of a show. Like some of Von Sternbergs he evoked, The Bitter Tea Of General Yen can look like a million even in dupe prints. 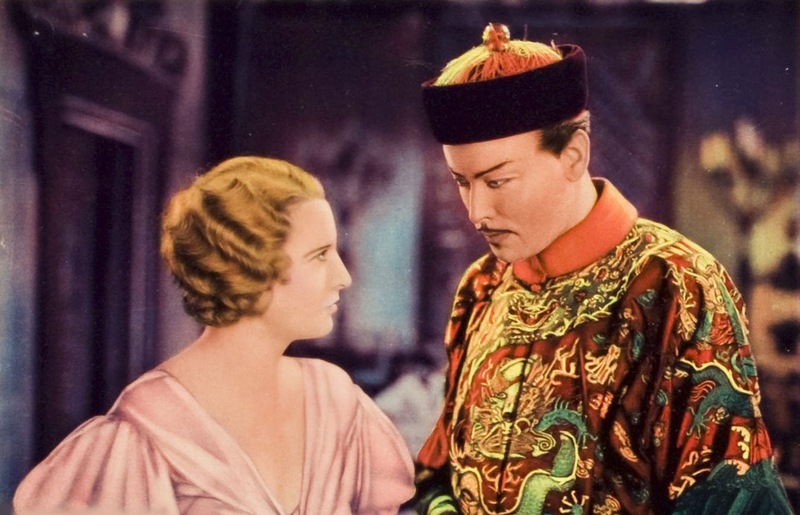 What got Capra and cast in hot water was daring stuff of interracial romancing between Barbara Stanwyck and tendered-as-Chinese Nils Asther (the actor was actually Danish-born and raised in Sweden). The big moment was a dream sequence where they clinch; it's still got punch for flouting what was then taboo, never mind our precode expectations. 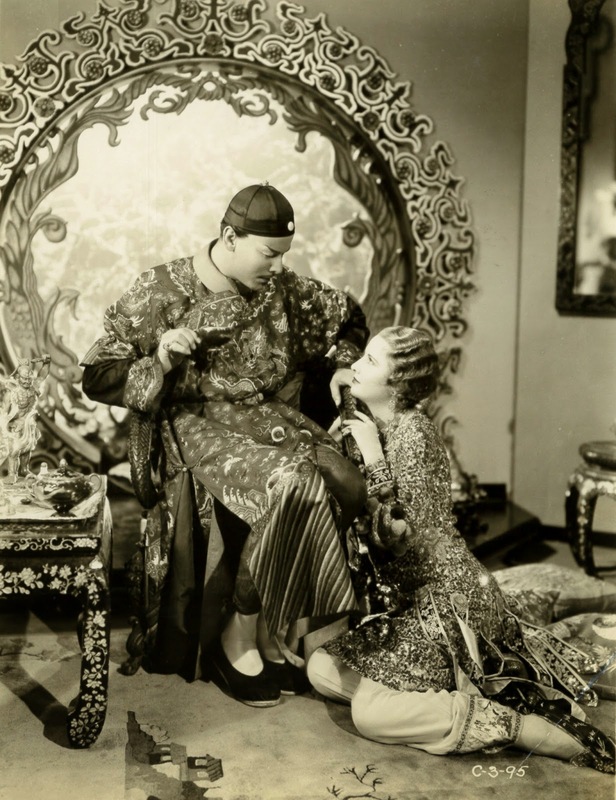 Trade reviewing called Capra's hand, saying he'd get grief for miscegenation content, and judging by failure of the pic, it's likely he did, at least in part for the Stanwyck-Asther hook-up. Nils Asther's General Yen may be a best feature of Bitter Tea. He's suave, ruthless, speaks multiple languages, and better attuned to Yank realities than ugly Americans he deals with, one of whom is Walter Connolly, a mercenary delight and one reason why Code police nixed a reissue Columbia sought for the film years later. 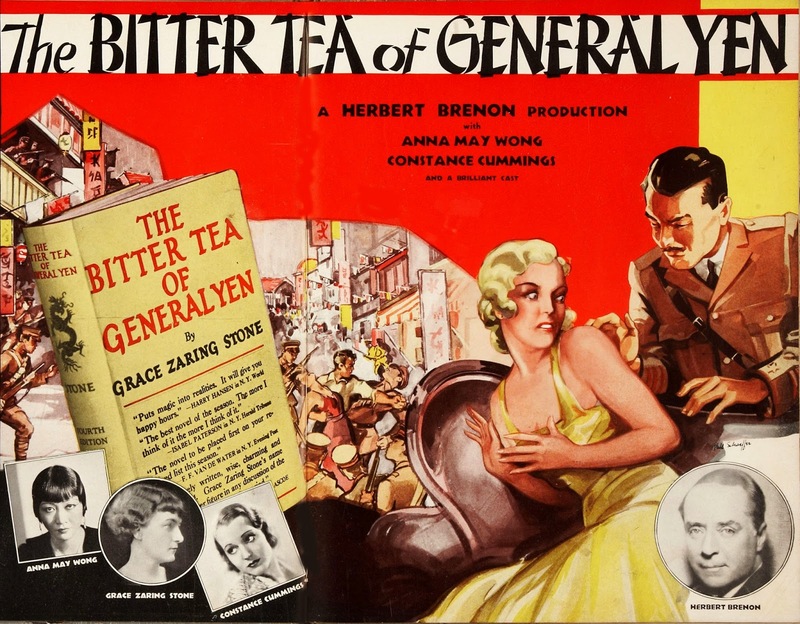 General Yen's obsession with the Stanwyck character makes sense, or doesn't, according to one's own acceptance of Babs as object of intense desire. How many in 1932, or among today's audience, would give up all for a roll with this actress/character, especially when she's so surly as here toward a frankly more likeable Yen/Asther? 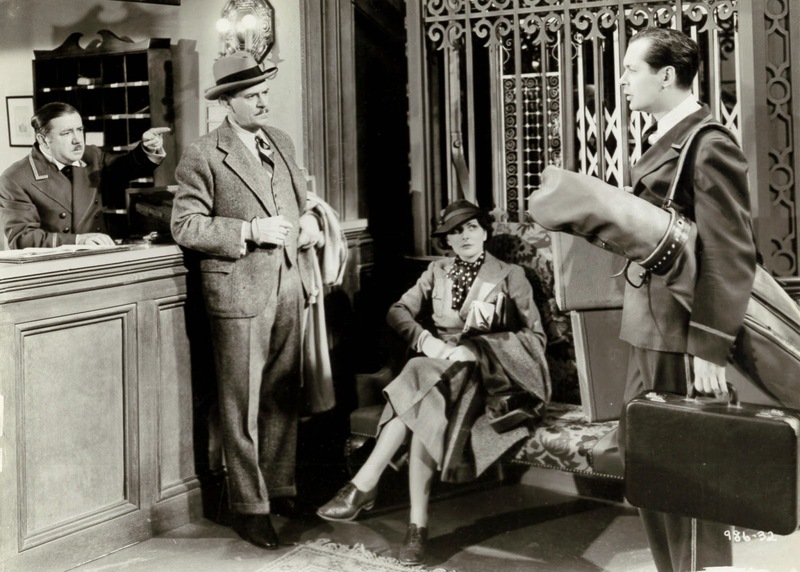 Capra would enjoy success, and a coveted Oscar (in fact, bushels of them), for getting back in a comedy groove with It Happened One Night, a truly momentous hit that would establish him as Hollywood's leading director of the 1930's. Useful Pressbook Art --- But What Was In It For The Ladies? The trouble seemed to be this: MGM had spent lots for a property adapted to Broadway success about men under stress of war, a war ended several years before. Legiters would pass on heart interest, result no women, that is, not one, in the cast. 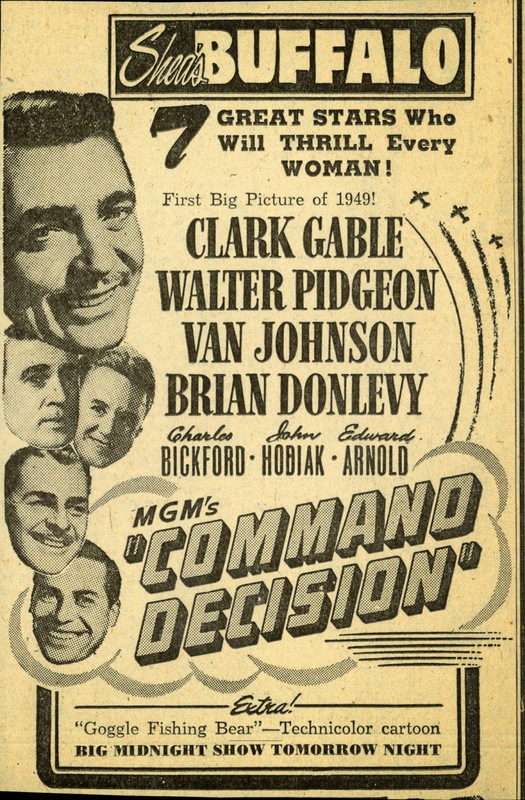 MGM hewed to that for translate of Command Decision to film, so no ground was given to worrying wives or sweethearts back home per formula of combat stories gone before. Fliers and those who'd led on the ground were invited to advance screen Command Decision and fill out cards re authenticity. Thumbs up from these put the feature on track for Academy consideration, perhaps a Best Picture for 1948, thus a three-theatre "Pre-Release" in Los Angeles for Christmas of that year to qualify for votes. Full-dress military police would act as honor guards for these openers, Command Decision a most lavish of postwar tributes to those who'd won the peace. Reward for Leo's effort was the L.A. Army/Navy Club placing Command Decision among ten all-time best war pics, a list that included Wings, The Big Parade, A FarewellTo Arms, and more recent Destination Tokyo, They Were Expendable, and A Walk In The Sun. All well and good this, but what of hinterland houses that relied on women to fill seats, or bring men/boys who would? Problems arose in wake of ads done for the pressbook, none of which were femme focused, a mistake that showmen on the ground would have to address. 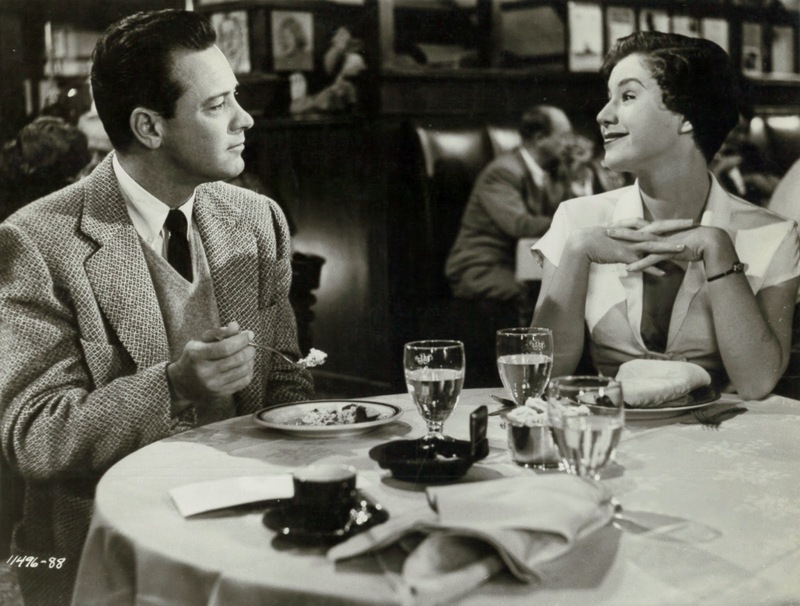 MGM had done a teaser trailer aimed partly to women, but it was too small an effort. 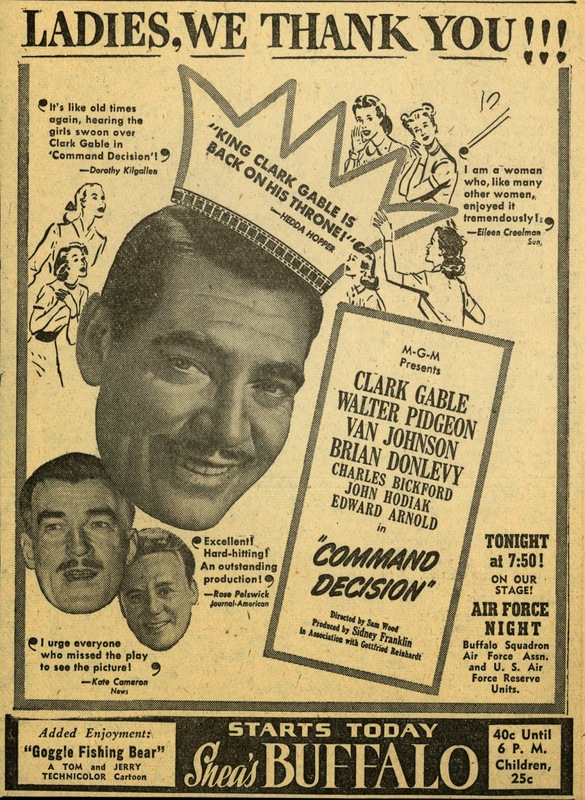 Command Decision was getting known as a new year's (and 25th anniversary) Metro show with appeal limited to men, and that was deadly considering fact that it was Mom, dates, and gal-pals that made command decision of what men/boys saw at theatres. How then to assure women that Command Decision was their kind of entertainment? One way, a most obvious one, was to emphasize Clark Gable (as in "The Ladies Love ..."), still swooning even on approach to a third decade serving Leo. Distaff columnists liberally quoted in ads guaranteed sisterhood that Command Decision would please. Ads shown here are from Buffalo and Kansas City, a pair of keys that would have been put on notice as to selling snafus elsewhere (L.A., NYC, Chicago), and making appropriate adjustment to their own promoting. Kinks could often be ironed out this way, subsequent daters learning from errors made on first-runs. More Command Decision at Greenbriar Archive. 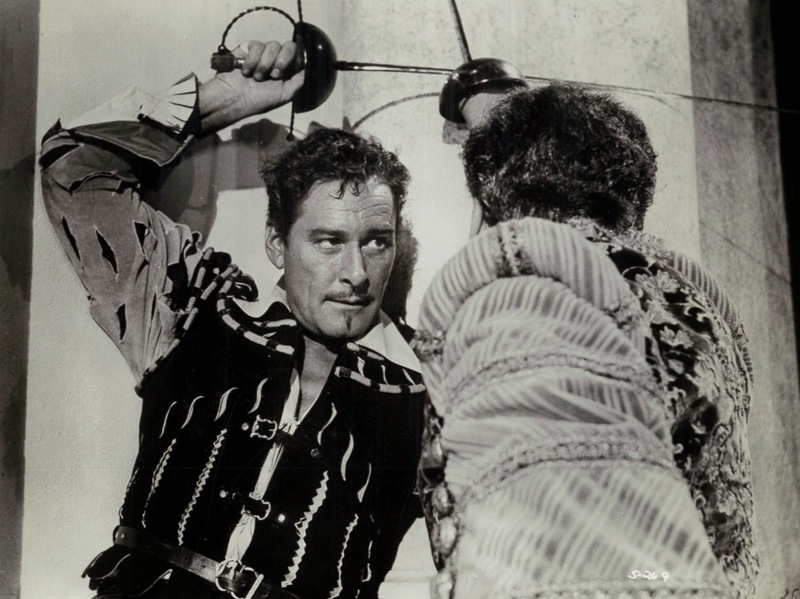 Of movie idols who thrived in the Golden Age, Errol Flynn may have been a truest Man Of The World. He'd been everywhere, had traversed oceans and penetrated jungles. To make movies on the continent would seem more natural to him than doing so on Warner sound stages, thus Crossed Swords as welcome respite from Burbank captivity. 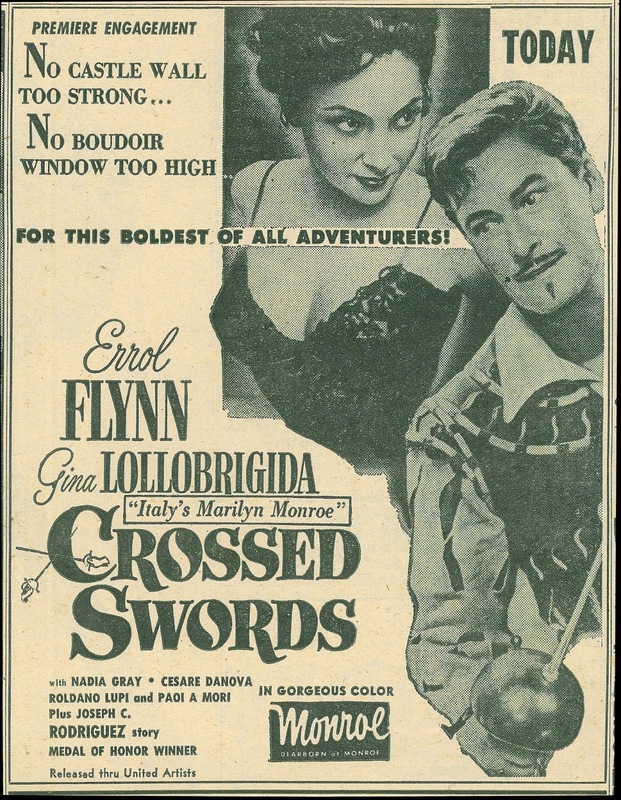 Flynn had just spilt from WB when Italian backers offered Crossed Swords. He was not (yet) a star in decline, as recent The Master Of Ballantrae had done extremely well, and may have made Warners regret their separation from Errol. 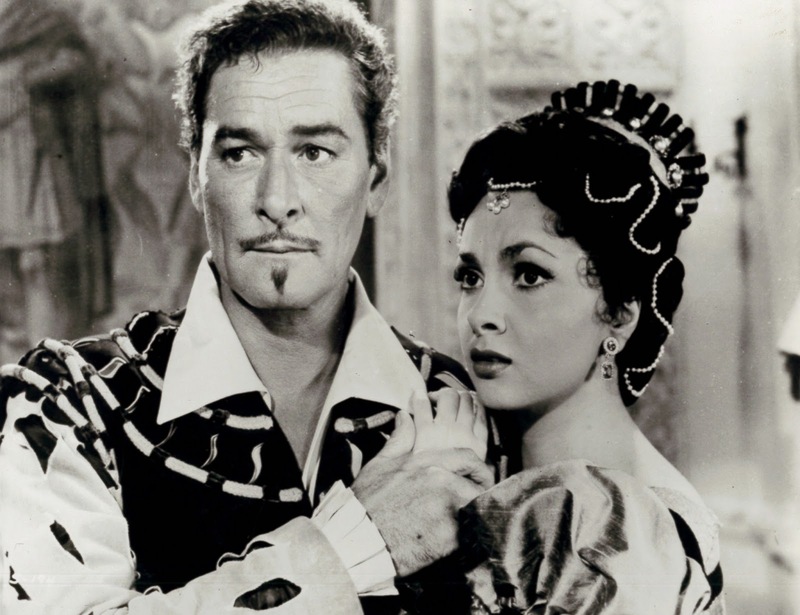 The latter's Italian venture was initially called Teacher Of Don Juan, the title a bit close to Warner's previous Flynn vehicle for comfort, thus eventual change to Crossed Swords. 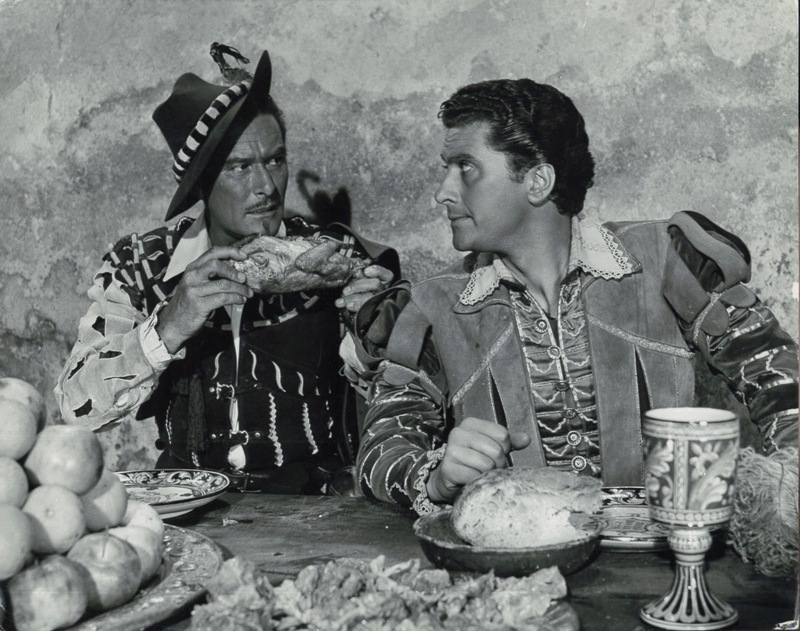 Errol's greater interest was launch of William Tell, his producing dream project for which Crossed Swords served as dry run. He was gad-flying among Yank picture-folk who were thick as flies overseas, and free with advice; both John Ford and Orson Welles were observed in hobnob with Flynn during the Italo sojourn. 1953 had begun with Errol laid up with flu, then jaundice, this as topping to a liver said to be in free-fall atrophy. These as cap for already dissipating features made Crossed Swords a less than flattering Flynn debut as independent filmmaker. 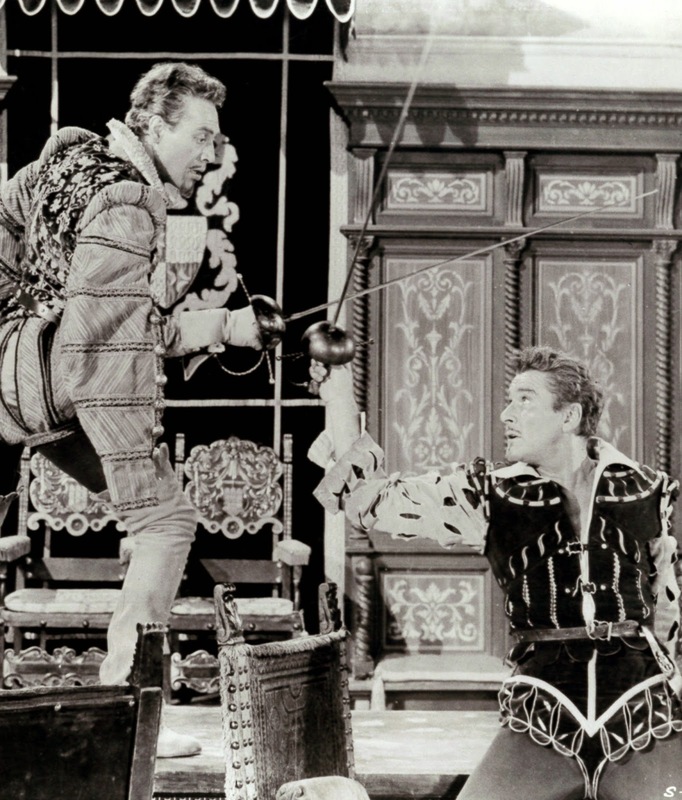 Still, his kind of action was catnip to worldwide audiences, and Crossed Swords had plenty of that, even if staging lacked polish of Warner duels past. Locations were a plus, however; borrow of castle and grounds adding grandeur to a not otherwise lavish production. Color photography by seasoned Jack Cardiff gave Crossed Swords at least the impression of richness. Flynn was spirited and cooperative; this after all was opportunity to establish himself as a free agent who'd henceforth customize his own star vehicles. Principal players spoke English, a must for US release prospects, while dubbing of support speech got by thanks to post-production assist from United Artists, that company having agreed to domestic-handle Crossed Swords and upcoming William Tell. Swords' co-star Gina Lollobrigida would provide merchandising advantage in the US, having appeared lately opposite Humphrey Bogart in Beat The Devil, and being sold as "Italy's Marilyn Monroe." Crossed Swords did tepid stateside business, only $332,000 in domestic rentals. 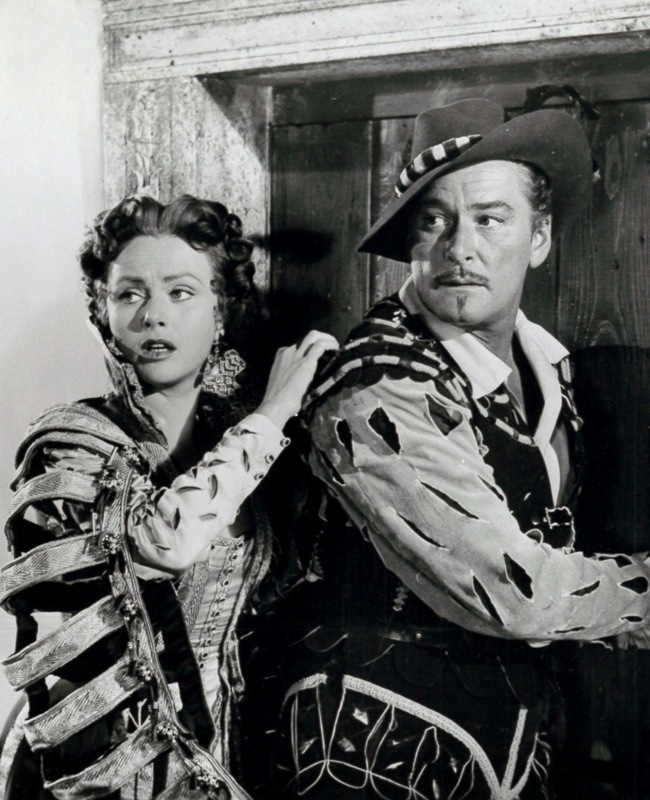 More might have been expected based on patron response to costumers Ivanhoe and Scaramouche. Maybe a US market got word-of-mouth that Crossed Swords amounted to pasta less digestible over here. United Artists sales wasn't to blame. 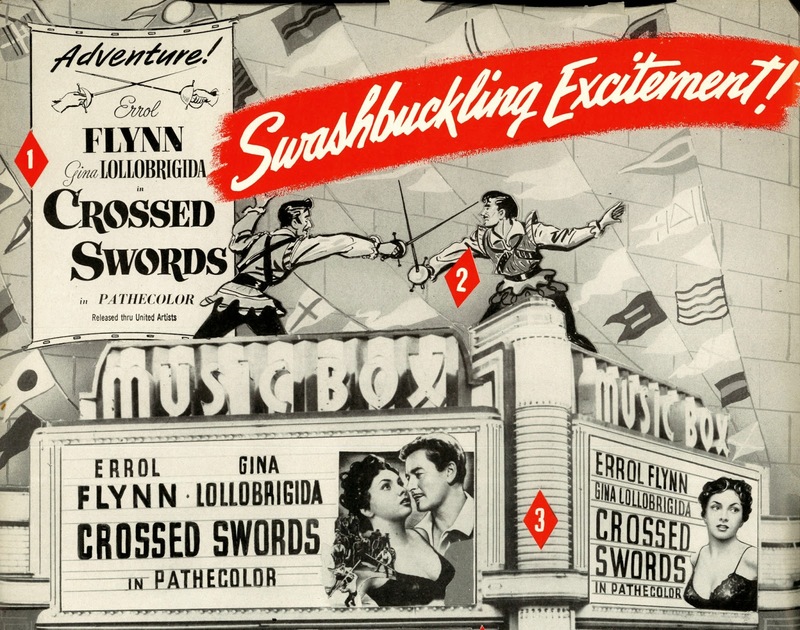 They'd issue a lavish pressbook and arrange opens where bally might help most, but reviews were soft, Variety stamping Crossed Swords as "routine escapism for undiscriminating audiences." B.O. response varied according to territory, but common to all was distinct falling off in second frames, as experienced by Chicago's Monroe Theatre, which started OK, but "went sluggish" (Variety) for a follow-up week. 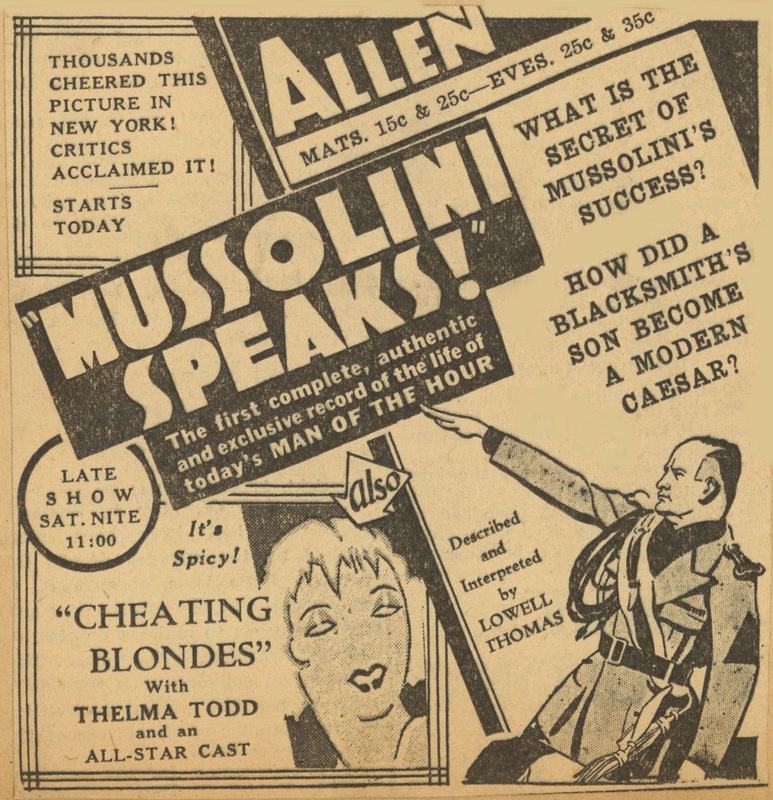 Part of trouble, said observers, was so-called "2-D product lack," that is, a conventional framed movie being sold to a public drunk on "choicest available Cinemascope and widescreen pix." Result was Crossed Swords on lower end of duals, like in L.A. where it played saturation support to Shield For Murder, a "bad cop" actioner done for cheap and B/W, but more promising withal than Crossed Swords. Was Errol headed for shoals? Fate of Crossed Swords couldn't have made it easier for him to raise cash toward finishing William Tell. Coming years would render Swords a tough one to track down. 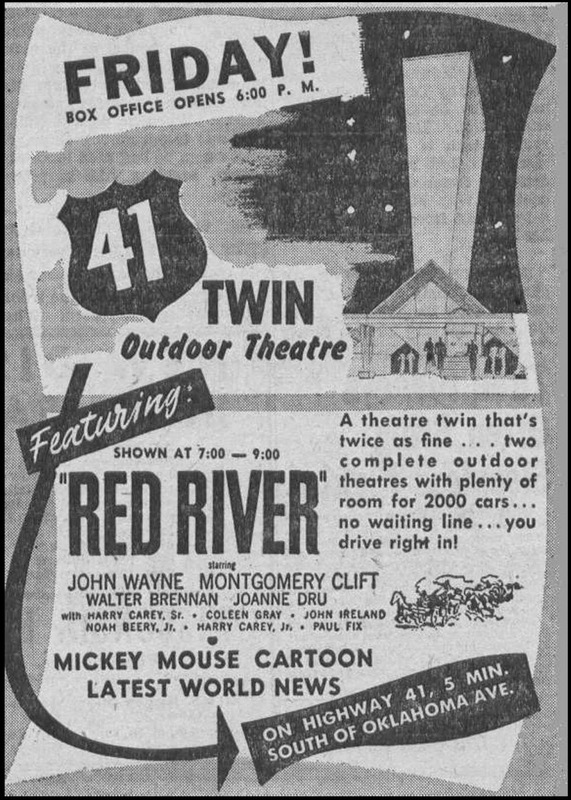 There was TV exposure via 1958 packaging among 52 United Artists features that included The African Queen and Red River, probably the strongest syndicated group, from standpoint of post-48's, being offered that year. Ownership today of Crossed Swords is cloudy, and DVD's offered thus far have been iffy. 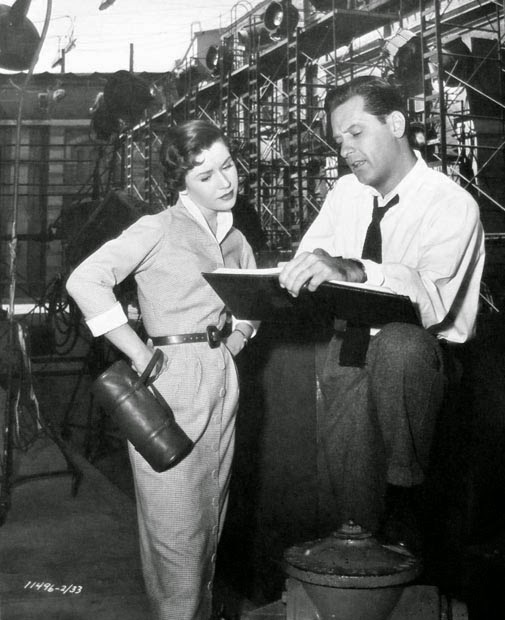 Paramount Introducing Telemeter and a "New Youngster"
A Broadway swing station between All About Eve and The Country Girl, Forever Female is a frothiest serve of backstage life. Success and prestige for All About Eve (multiple Academy wins) inspired performers to examine themselves. 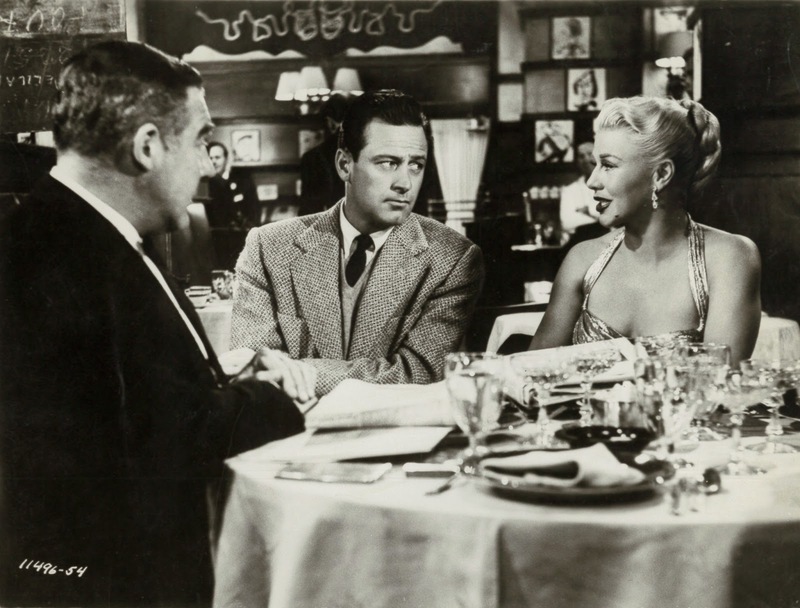 The business of entertaining came under scrutiny, from filmmaking in The Bad and The Beautiful to burlesque of Top Banana. Knowing there was most drama in legit, Hollywood put its opposite-coast rival under hot lamp of truth-telling re egos and stardom passing prime. 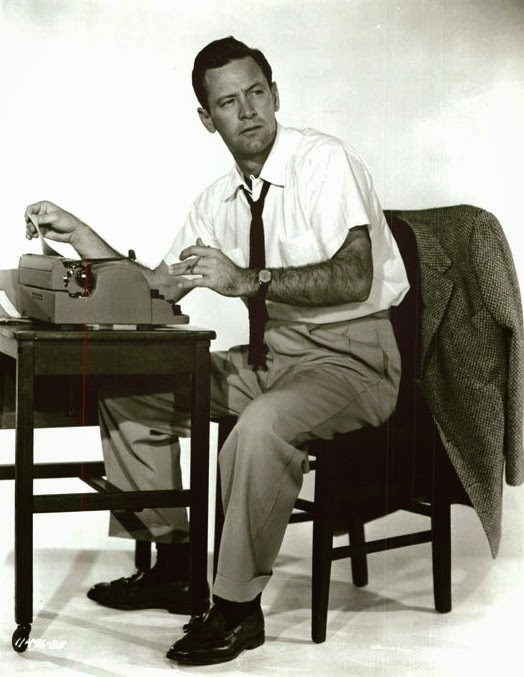 Examinations could be merciless, as for Bing Crosby in The Country Girl, Ginger Rogers for two occasions, Forever Female plus Black Widow, and always there were kids trying to break in, most at Metro where Broadway translated still to melody rather than melodrama. Paramount's bid with Forever Female served purposes beyond mere nod to Eve, FF being launch pad for "Future Star" Pat Crowley and a home viewing format Para hoped would revolutionize entertainment, Telemeter. 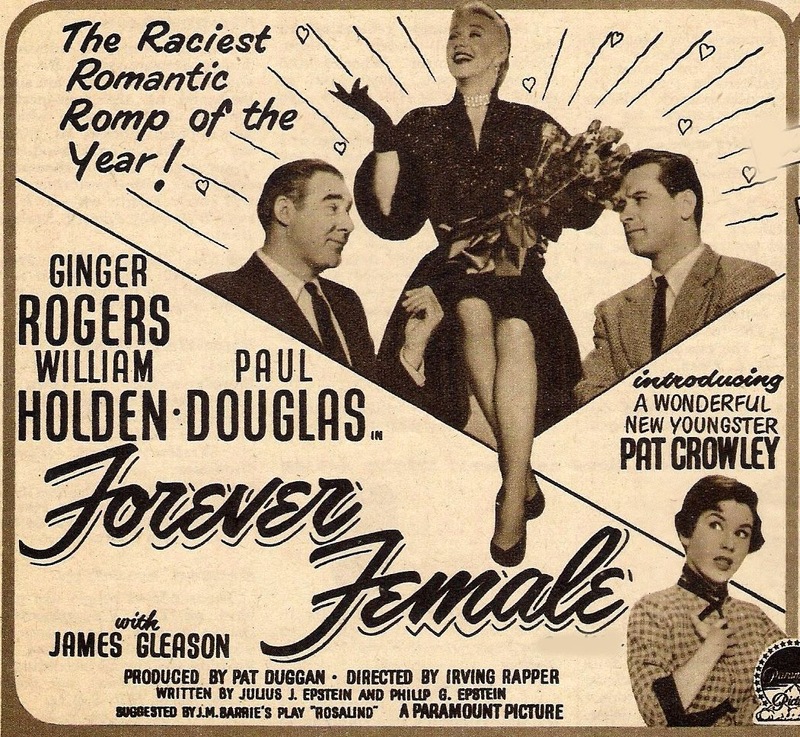 Movies still, as always, served youth best as of 1952 when Forever Female went into works. The original title, Reaching For The Stars, might have been more apt to describe struggle of newcomers to seize the stage, and it was a same in Hollywood where failure to cultivate fresh personalities was noted ("Famine In New Faces," complained Variety). Trouble was the town overselling untried talent on conviction that an organized enough campaign could make any product stick. Such may have been a case with Pat Crowley, who had pluck and oodles of pep, but thudded despite a marketing assault comparable to Rommel's across African desert. Not that Crowley lacked goods, but even she might have suspected these were oversold. 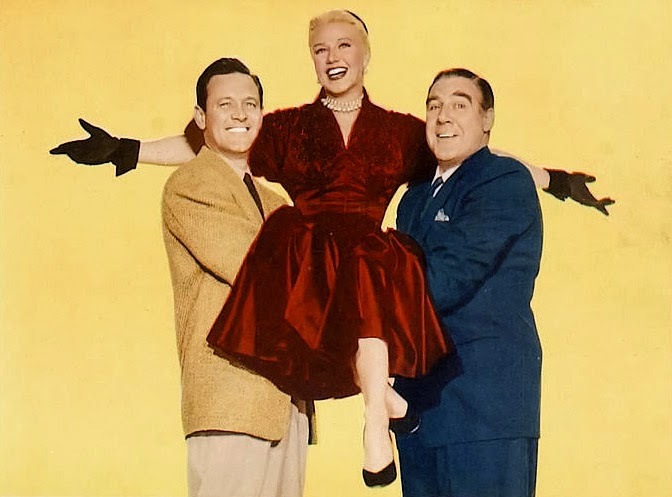 Everywhere was seen her face from September 1952 and transplant from stage and TV beginnings (Carousel and a Tovarich re-do on Broadway, plus A Date With Judy and anthologies for the tube). 750 unknowns had been interviewed and/or auditioned in New York by Para scouts, from which three were brought to Hollywood for screen testing. The winner would get not only an extended contract, but the ingénue lead in Forever Female. Others, then, were being evaluated besides this trio of girls, namely Paramount star-builders who'd be put to their own test of creating a next "overnight" sensation. Let it be done a new way, suggested Paramount chief Don Hartman, and so it was left to studio rank-and-file to select a winner from the three contestants. This may for once have been on the level, Variety reporting "White-Collar Casting" conducted by "secretaries and office boys" brought to screenings of the tested femmes for purpose of picking a winner. Paramount could then straight-face announce this most democratic means by which stars were now born. Not from cynical press room recess, but via honest selection by working folk just like ones buying tickets. This was clever means of manufacturing a star with clean hands, though you wonder how losers Christine White and Sally Heston felt about the contest. I checked fate of both at IMDB. 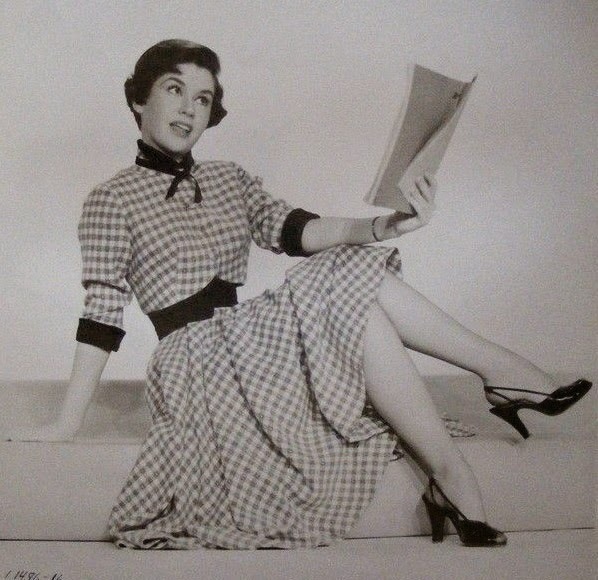 Christine would do uncredited bits in features like Vice Squad, turn up in 1958's Macabre, and much, much television. Sally Heston didn't turn up at all. 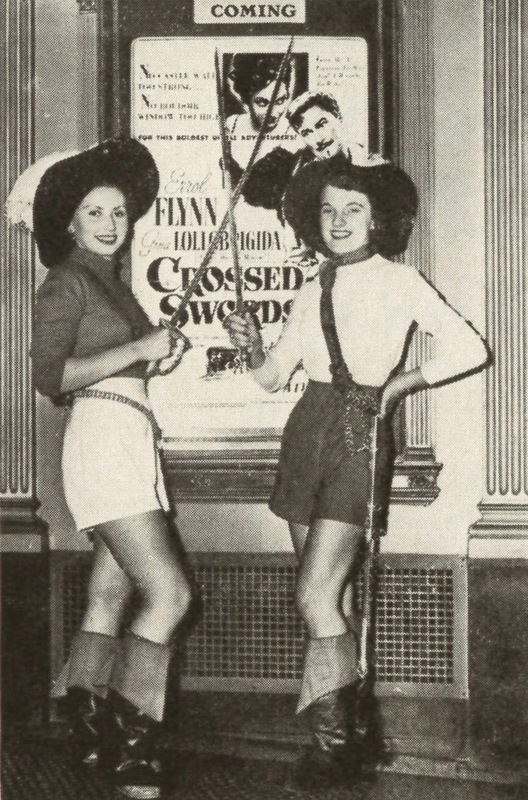 Count these two, then, among the 749 who tried and failed at brass casting ring of Forever Female, but was Pat Crowley so much better off for getting the part? A judge had to approve the nineteen-year-old's starting salary of $350 per week, it understood that $1,000 might be reached should Paramount exercise all options over a seven-year contract period. This was the same sort of indentured servitude long practiced by majors, but Para wasn't for sinking so much publicity into property they didn't own. Column/news mentions were frequent as Forever Female went into production (10/1/52) and build-up of Pat Crowley intensified. As in multiple Star Is Born fictions, there was move to change her name, Paramount hiring a "Hollywood numerologist," who proposed fifty-five variations on a new moniker, such being old style huckstering of perhaps unhelpful sort, so again Para turned to on-lot wage earners for assist. In what may have been a staged revolt, Crowley herself said no to the name switch and even to billing as Patricia, preferring the more gender-neutral Pat. "Anybody who sees me will know I'm a girl," she cheekily told Army Archerd. How then, to keep light focused on Pat Crowley as Forever Female waited out the year to release? Here was a showcase wrapped fourteen months before audiences would see it, with a personality that needed to register during the interim. 1953 would amount to haul of a comparative unknown to a press and public who'd not see her on screens till after Christmas. In a meantime, there was utility work that Pat Crowley would perform to earn keep. She and Para pactee Jan Sterling escorted ex-P.O.W. guests to the 7-15-53 premiere of Stalag 17 at the Warner Beverly Theatre in LA, while tests were conducted later that month by director Michael Curtiz in which Crowley participated, the object to determine which camera lenses would work best for Paramount's new Vistavision process. Other studio ingénues to pose included Marla English of later AIP fame, and Kathryn Grandstaff (Grant). There would come the inevitable Photoplay magazine award that placed Crowley among 1953 newcomers "most likely to succeed," the honor shared with seemingly every young player the industry had in hoppers that year. 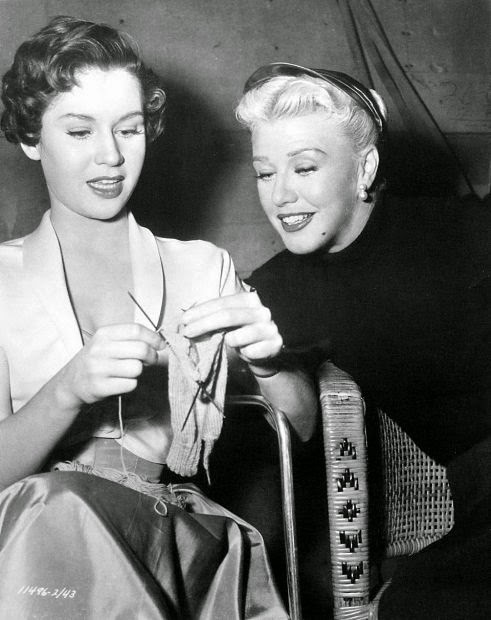 Where Forever Female made trivia history was its being a first-ever major studio feature to World Premiere on television, even though that November 1953 event was restricted to "sunny and prosperous" Palm Springs viewership. Paramount's experimental "Telemeter" would be means by which entertainment could be delivered to home sets as cable later would be, an idea years ahead of wider 70's implementation. The idea of a "boxoffice in the home" especially appealed to Para topper Barney Balaban, who liked prospect of selling tickets to hearth sitters. If they wouldn't go out for a show, the show would come to them, at coin deposit price. Anyone who'd fed gas meters would know Telemeter as an old friend, only this one gave movies for money, sans necessity of leaving armchairs. Here was where that "lost audience' could be got back. 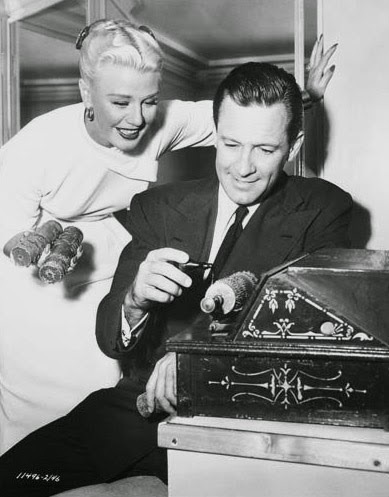 Paramount half-owned the system with International Telemeter Corp. of Los Angeles, and 11/53 launch would see Forever Female in simul-opening at Palm Springs' Plaza Theatre plus local TV sets to which coin boxes had been attached. Telemeter was fed off a closed circuit that served Palm Springs viewing, so could avoid FCC ban on pay television, this not being classified as "free air" (the signal coming in on phone wires). 400 households subscribed to closed circuit TV, and 71 of these participated in the Telemeter test, paying $1.35 to see Forever Female's evening broadcast, which followed the afternoon's USC-Notre Dame football game, home-received for a dollar. As to outcome, said International Projectionist magazine, opinions differed. "It was felt by some that Forever Female was not the best choice for starting the test. A comedy is enjoyed most with a large responsive audience rather than when viewed by a few people at home. Also it was noted that TV reproduction tended to blur or wash out detail in backgrounds and long shots." Toward bally for the event came one star of Forever Female to theatre-appear and visit Palm Springs homes in which Telemeter was installed. That star was Pat Crowley.